In addition to this, there is a huge value proposition in integrating AR with Artifical Intelligence, Robotics, and Machine Learning. With AR support, manual services like small repair works can be delivered to a customer by a technician remotely, without having to visit the client’s residence or company. Increased Efficiency: Everything from training and repairing modules to sensor information can be uploaded to the technician’s AR glasses. This will guide the technician through the process and also allow him to look inside the device and gain temperature, sensor, and pressure data. This will allow the technician to visually inspect the device without physically interacting with it. Moreover, this will also help in the elimination of distractions and the need to look through manuals for hours. The result is gained efficiently, which translates into cost savings and satisfied customers. Follow Complex Procedures Easily: Integrating AR with field service management software will help technicians to instantly access the service manuals containing interactive 3D animations to deal with any unfamiliar equipment. Though the technology is not here yet, AR will allow field service technicians to follow difficult instructions without having to constantly refer to tablets or smartphones. AR allows the graphical information to be displayed over a physical environment, which makes it a lot easier for the technician to understand what they need to do to complete a specific step. Improved Service Delivery: Artificial Intelligence will affect field service by providing a digital experience that will offer both assisted and self-service interactions. AR will help in giving customers a reason to buy and use the services by offering them an immersive experience that can help build a connection and brand recognition by conveying your services in a VR environment. Assist Customers: Field service technicians and customer service representatives will be able to virtually guide customers through maintenance or repair procedures. For minor repairs and service calls, a field technician may take a virtual tour to help the customers fix simple problems. This can also be clubbed with AI when a user error is involved and a virtual assistant can pinpoint at what the customer needs to do to get things back in working condition. This way the service is instant and easy. Confirm Product Information: There is field data collection software that collects data from connected devices like MRI machines and HVAC unit. This software manages the information with AR-accessible tech and enable technicians to predict how many of service hours a device has left before it needs to be replaced. In addition to this, AR can also help the service team to confirm device details like parts number, the model and generation, and how it responds to environmental factors. Train New Technicians: Given the current issue the field service industry is facing due to aging and retiring workforce, this will be one of the most important uses of AR in the field service management industry. Hiring novice technicians and training them on-the-job will become much easier with AR implementation. Moreover, in today’s gig economy, mobile workforce management software integrated with AR can help in hiring labor remotely and the technicians can be assisted with a repair sequence featuring a series of 3D technical illustrations, guiding them on how to solve the problem. Though there can be situations where senior technicians need to assist, if the experienced personnel can deliver assistance remotely, the service organization can free up labor more efficiently. Improved Data Analysis: AR with AI can help service organizations and technicians make better service decision through an improved analysis of data collected from customer contact and field data collection software. This means that companies can do more and gain deeper insights with the customer data that has been accumulated. This improved data analysis can help to determine which locations prefer AR to in-person house calls. 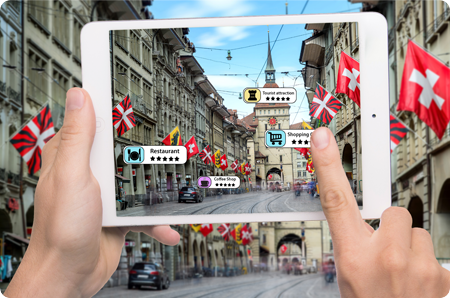 Visual Information: AR can deliver multimedia content to reach different types of learners that make it a useful tool for a variety of user base. The majority of the population are visual learners and need to see what they are learning. AR devices on tablets will provide the representation that will help users understand and retain information. Approximately 30% of the users are verbal learners and can be immensely benefitted with AR technology. AR-enabled devices will help users put their hands on the device and thus take training and deploy their knowledge in the field service tasks. In addition to these, AR can power field service for a range of products from complex industrial equipment like turbines to customer-level products like appliances. It is clear that AR has the potential to make the field service environment more effective, efficient and safer place to work. These types of technological advancements will only help the field service industry to continue moving forward to fulfill their aim at improving customer satisfaction. Augmented Reality is shaping the reality of the field service industry. Businesses are leveraging the technology to make a dent in their operations and manage their onsite workforce. FieldEz is your answer to field service management software if you are looking for something that has the potential to turn around your scenario and make you efficient and productive while managing a remote workforce. …and much more. FieldEz is the field service management enabler you have been looking for.